alaTest has collected and analyzed 93 reviews of Krups EA 9010. The average rating for this product is 4.4/5, compared to an average rating of 4.4/5 for other products in the same category for all reviews. People are impressed by the durability and maintenance. The design and performance are also mentioned favorably, but views about the reliability and noise are different. Some have doubts about the price. We analyzed user and expert ratings, product age and more factors. Compared to other products in the same category the Krups EA 9010 is awarded an overall alaScore™ of 90/100 = Excellent quality. The $2,500 Krups EA9010 espresso machine commands a high price, but if you desire delicious espresso and frothed milk drinks made with almost no effort it's worth every penny. 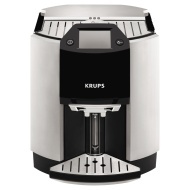 The super-automatic Krups EA9010 might be stunningly expensive but it's sure to please the well-heeled who crave great espresso and cafe drinks delivered at the push of a button. "Excellent coffee from a great machine. Easy to set up and easy to use, with a good variety of settings to choose from." Great bean to cup machine with fantastic tasting coffee! Specialty coffees can't be added to favourites.